Adorbs! 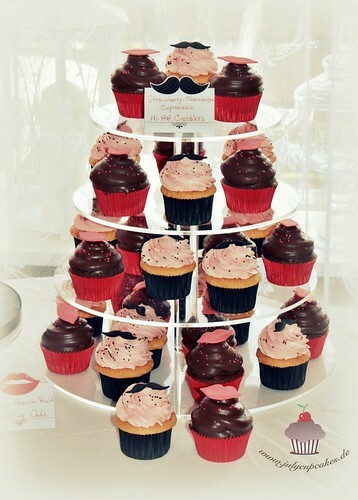 I love these lip and mustache cupcakes made by July Cupcakes. What a great idea for a wedding! Check out the cupcake tower. OMG!!! This blog makes me super hungry!!! All of the ideas and finished products are amazing, colourful and look tasty. 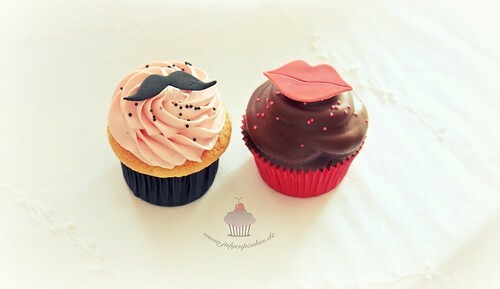 These lips & moustache cupcakes are by far my favourite on the blog. They are definatly a perfect idea for a wedding or engagement party or even a joint birthday party. Also found this blog to be handy when looking for receipes, especially receipes for Red Velvet Cupcakes :) Im definatly a little bit sceptic about the Pumpkin cupcakes, maybe i will try them one day!! Thanks for posting tasty treats, inspired me to have a baking weekend. OMG!!! This blog makes me so hungry!!! There are so many great colourful and tasty ideas on here, which I wouldn't even think of creating. I'm a big fan of the lip and moustache (male & female) cupcakes, they would make such a great idea for a wedding or engagement party, or event a joint birthday party! I found this blog had a link to an awsome Red Velvet Cupcake receipe (which I think I might give a try this weekend). I am definatly a little sceptical on the pumpkin cupcakes, maybe I will have to give them a try before i knock them! Keep posting great ideas and tasty treats! It's inspired me to have a baking weekend!